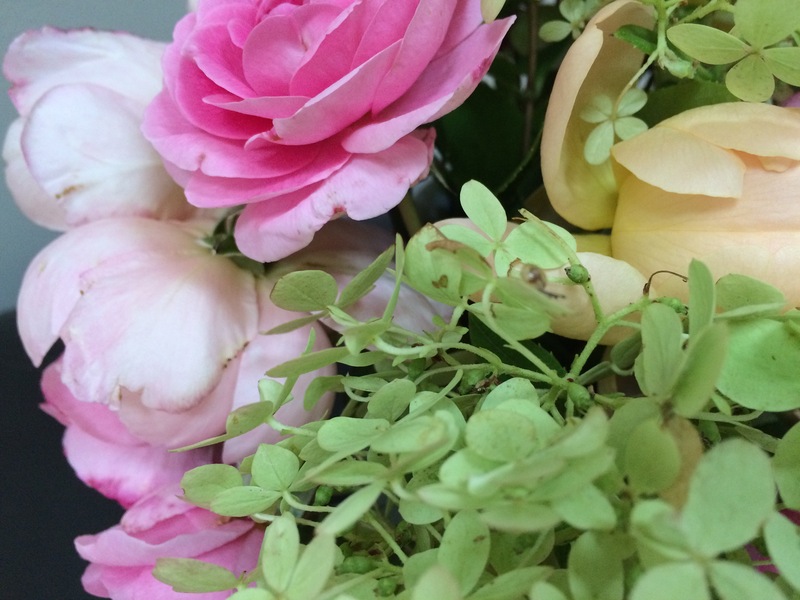 In a vase on Monday: Quick! 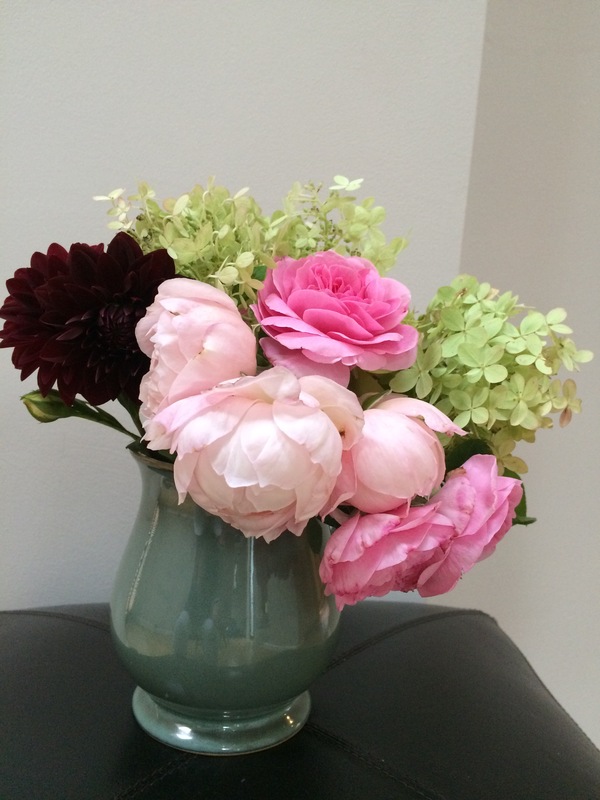 The day has flown by, so quickly before I get dinner ready, I had better grab some flowers for a vase. Roses are having a resurgence right now, dark pink is Gertrude Jekyll, yellow is The Pilgrim, peachy is Lark Ascending and the very pale pink one which was already here, name is unknown. Added to the roses are Hydrangea Limelight. It has struggled in the heat as it is in full sun until about 2 pm and has browned in places. I had to add the rather dark velvet dahlia Arabian Night. I especially like the lime against the pink and peach colours. So pop over to Cathy at https://ramblinginthegarden.wordpress.com and see a host of other vases which are sure to help you unwind on a Monday. Very pretty. 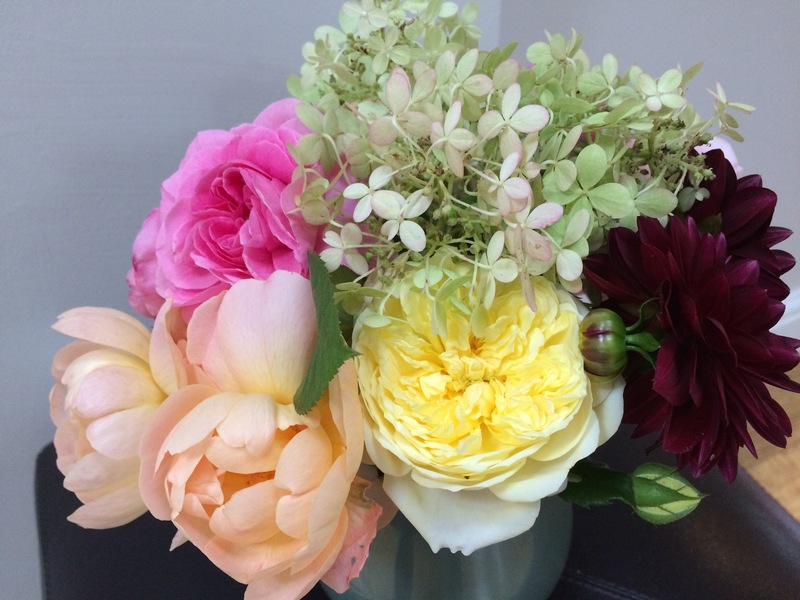 Love your jug…would work for any color of blooms. 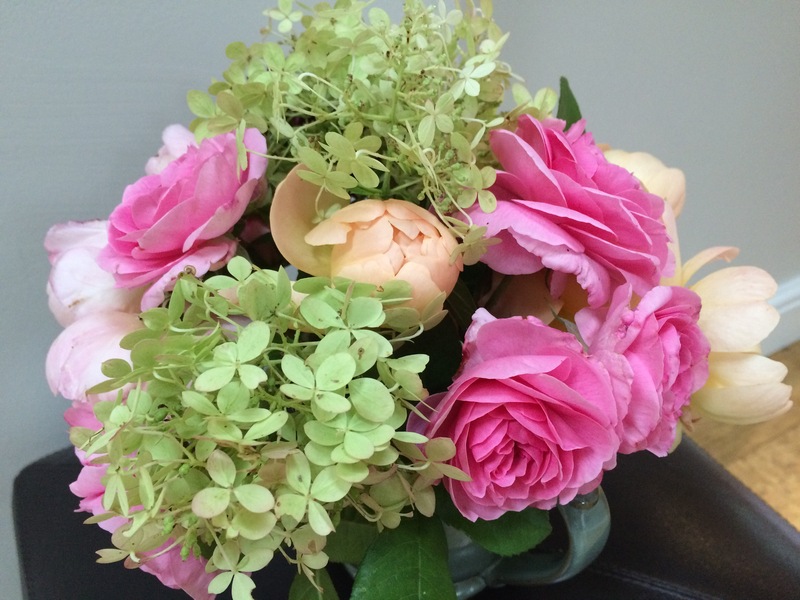 Thank you Marian, now you mention it I agree; green is a complimentary colour for most flowers. It is a pint mug. Gorgeous, love the pinks of the roses and the jug. Hydrangeas can be difficult to get into the right spot. Hi and thank you. This hydrangea was planted in Spring and it is an experiment as it is in gravel with clay below. So far so good but I will see how it fares this Winter. Interesting experiment, I finally had to have only Oakleaf Hydrangeas when I lived where I could grow them – very dry clayey shade. One of my favorites and native to where I am from – my grandfather called them Grancy Greybeards. I am from Atlanta, Georgia. Grancy Greybeard means Old Mans Beard and can refer to Fringetrees as well if you are familiar with those. My pleasure. The jug is actually a pint mug. Gertrude is very thorny but the strong rose scent and colour makes her very pleasing. 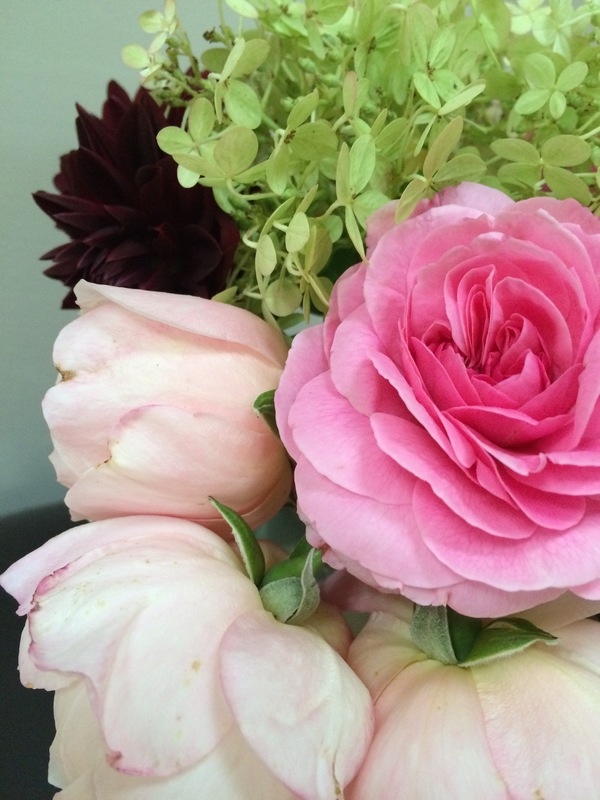 I love the voluptuous feeling of the roses in your vase today; beautiful colours too. They are a good mix I think. Thanks Cathy. 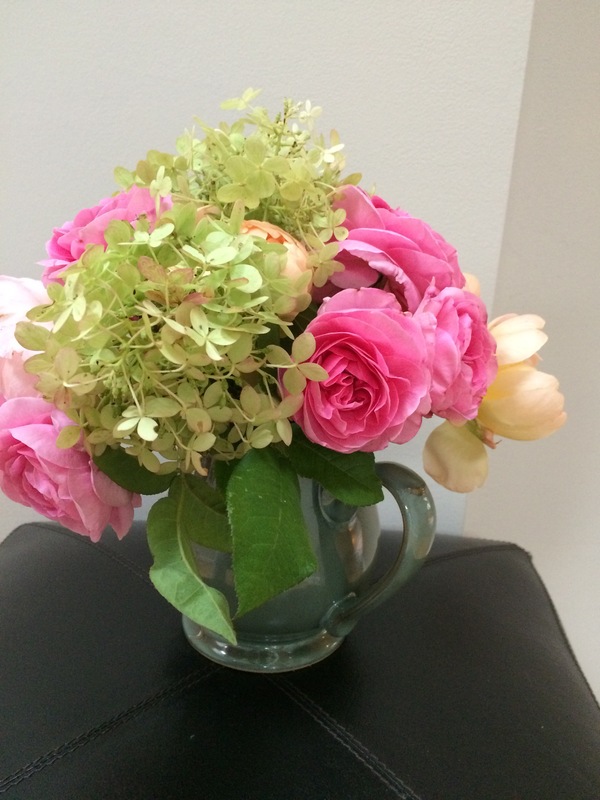 Lovely jug and gorgeous roses. I grow Arabian Night too, it is a great favourite of mine. Good taste😊 I am going to be on the look out for cafe au lair to add to it next year. Cafe au lait is a gorgeous colour and the flowers are massive.